US-Pakistan politics aside, I enjoy my longish stays in the US, whenever I visit here, usually in the summers. One reason is the many opportunities this country provides for “the pursuit of happiness,” which, in fact, is enshrined in the American Declaration of Independence as an “inalienable right of man [and woman]” along with life and liberty. Before you jump to conclusions, I don’t mean the happiness one usually associates with Western cities, and certainly not anything of prurient interest. I am talking about the happiness one derives from learning new things — a new subject, a new language, an occupation, a skill, a sport, an interest or a hobby. You can pretty much do anything here if you set your mind on it. There are no barriers of age, gender or race, nor any social or other constraints. Of course, you have to pay the fees — most of the time. Early this summer, I signed up for a flying trapeze class — almost — in a facility located along the Hudson River, in lower Manhattan. We usually associate trapeze with circus, where acrobats swing out hanging on to a flying bar, do a few somersaults in the air, and then either land in the clutches of another catcher or fall on a safety net down below. It’s a thrilling sight on a cloudless day against the backdrop of the Hudson River and Jersey skyline. The class is open to everyone, for fun and exercise. The only condition is age — not less than eight years. There is no upper age limit. I easily qualified. But I chickened out at the last minute, though. Falling from high above, even though into a safety net, looked a bit hazardous. But the opportunity is there and the fee is affordable. I might muster enough courage to still join. On a more serious side, a friend of mine, originally from Lebanon, a brilliant student in school and college, after doing his BS and MS in electrical engineering and physics from MIT in 1991, worked in investment banks and financial companies for over 16 years. This year, he had a change of heart and decided to become a doctor. He applied to Tufts medical college and was accepted. He is likely to graduate in 2013. By the time he finishes residency and becomes a practicing doctor, he will be 50. This is just one such example. Circumstances compelled me to extend my stay here this year. Having more free time on my hands, I walked into the South Asian Studies Department at the University of Pennsylvania, an Ivy League university, to see what was available this semester. Going through the material posted on the bulletin boards, I was amazed at the variety of subjects. 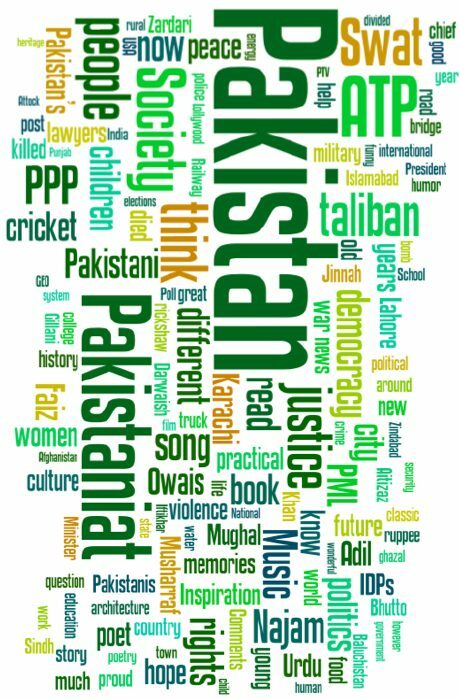 There were courses in studies on Imams Bukhari and Tirmizi; courses in Islamic history, Ottoman history and modern history of Afghanistan and Pakistan; language courses were offered in Arabic, Persian, Urdu, Hindi, Punjabi and Bengali, and in Urdu literature written about the Partition; there was a also a course on learning to play tabla and sitar. 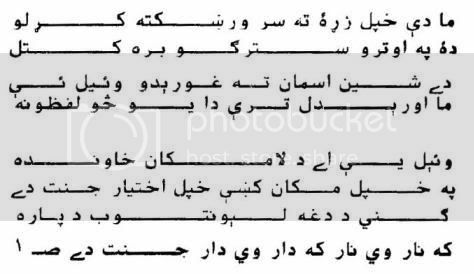 And, then I found a course in Pashto poetry. I chose to attend this class, more out of curiosity than anything else. The class teacher is a young American from Maine who has spent considerable time in Afghanistan and Pakistan. He speaks Pashto fluently in Afghan accent, and knows the grammar and nuances of the language better than most educated Pakhtuns. A young woman from Baffa, district Mansehra, has joined him this year on a Fulbright scholarship, to assist him in teaching basic Pashto to beginners. After attending the first two classes, and studying two poems, one by Ajmal Khattak and the other by Shafiullah Babarzai, an Afghan poet, I was hooked, and am determined to stick to the course till the end. It’s a pity that I won’t find such courses, say, in Qaid-e-Azam University in Islamabad. Nor could I find any good books on the subject in some of the biggest bookstores in Islamabad. I asked a mullah, what do you think is Paradise like? I asked him, what do you say? I asked him, do you know what Paradise is? I asked, what do you say, philosopher? Who says Pakhtuns produce only poppy? They produce wonderful poetry, too. Happiness, as I said in the beginning, is doing things that one enjoys doing, not necessarily for money but also for self-satisfaction, self-enhancement and self-actualisation. And the societies that provide such learning opportunities end up enriching themselves in the process. 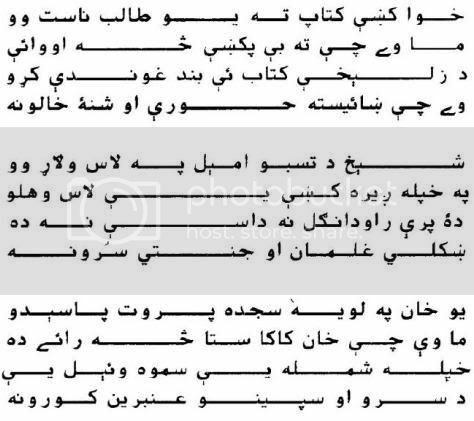 Here is the poem ‘jannat’ is Pashto script. I am writing a book on Khattaks. 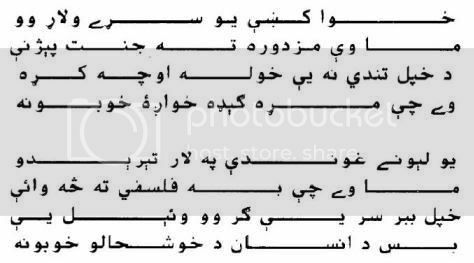 I want to include this poem by Ajmal Khattak baba. I wish to use your translation with proper citation. You are requested to kindly allow me to. That’s so racist and anti-Pashtoon, it stinks.